How fix in Epson printers "Error turn off the printer. And then on"
When your printer has an error and must be turned off and on again, the printer, follow the steps below to fix it. The printer error. Turn it off and on again, it is a message that appears on the equipment manufacturer Epson, and it really is something to worry about. When appears, the printer may be taken to Epson service, but we can prevent it from happening to more, solving the problem with the procedures presented below. 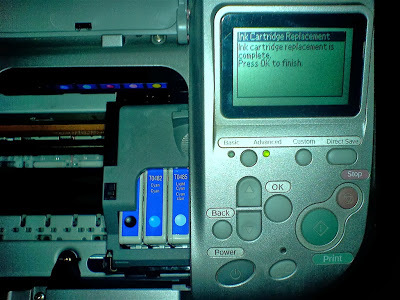 It is called a grave error, but with solution and it is important to know that, because of some misunderstanding with the system, and may appear to the printer this ignorance of cartridges, if the computer shuts down unexpectedly (high or low voltages ), ink cartridges not properly connected among others. Do not remove the cartridges in the normal way - turn on the printer when ink cartridges are where you can get cartridges remove them - then turn on the printer without cartridges when this switch to request put cartridges, put. If the problem still continues, you should try the steps below. Paper jams can cause the error in the same way, to remove a paper jam on these printers, you must turn it off and then pull the page, if not done correctly, the above mentioned error appears in the publication. If you have already done and now has the bug, you should check carefully into the printer and remove any paper you see — of course with the printer turned off, this and any procedure should have the power off — then turn the printer and check if the problem continues. Something a little and necessary as technical knowledge is high, open the printer and check the gear it is very possible that this locked, should not have much knowledge and printer be within the warranty period, contact the Epson support if the printer is no longer under warranty where it should lead technician printers. Be very careful about who gets to check your computer, computer technicians can try to solve everything that has to do with the hardware, but is not, can even damage the equipment, always in every village, there is a company or only someone who is dedicated to this work. en.Rellenado: How fix in Epson printers "Error turn off the printer. And then on"